Dr. Sahni is board certified by the American Board of Neurological Surgery and is an American College of Surgeons Fellow. He has been published in numerous medical journals and has spoken internationally on neuroscience subjects. 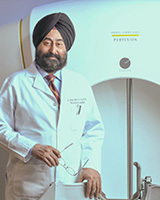 Dr. Sahni completed his residency in neurosurgery at the Medical College of Virginia in 1983. He served as assistant professor of neurosurgery and director of stereotactic and functional surgery at MCV until 1988. He joined CJW in 1989, where he has served as chief of neurosurgery. Dr. Sahni has performed more than 1,000 procedures on patients with trigeminal neuralgia in the last 20 years. His other areas of interest include trigeminal neuralgia, hemifacial spasm, pituitary tumors, acoustic tumors and meningioma.